Connecting with students is so valuable to building brand awareness. Fail to win the crowd, and you’ve failed your mission. If the students are buying into your attempt to create a trendy promotion, then they will help you out by preaching your brand in their own way – social media having the biggest impact on a brand’s success. Usually, making that connection involves lots of product sampling, plenty of signage in the right locations, and even beach stage set-ups that force your brand to stand out among the rest. But it’s also about having a great product to push. Activations that are able to engage with students via any form of an experiential tactic are more likely to succeed in having student “influencers” take that brand experience back home to their college friends on campus. Brands that offer more “engagement” and allow for someone to “experience” a product are more likely to succeed. For example, the BuzzBallz not only offered free samples of their various flavored beverages, but also encouraged students to do something spontaneous “for the camera” in order to earn free t-shirts, sun glasses, and other cool prizes. 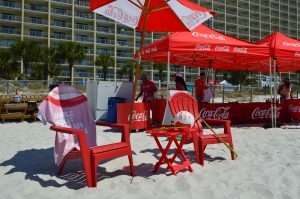 Coca-Cola was back with CMG this year and encouraged students to try out their cool slip and slide on the beach, grab a coke and perhaps lounge out under their beach umbrellas. Newly launched app Secret rewarded students with VIP passes, shirts, and selfie sticks for downloading their app. Creating a fun and memorable atmosphere in which college students can react positively to has always been the main goal. Delivering an authentic message on behalf of clients in order to have targeted consumers leaving with an impression that will stretch far beyond Spring Break is the objective. CMG has become a leader in the student marketing space and works with brands all year round to help connect them with students. Spring Break has been a special arena for CMG to actively work with brands and generate success stories.